Efficiency and driving dynamics are not excluding each other. 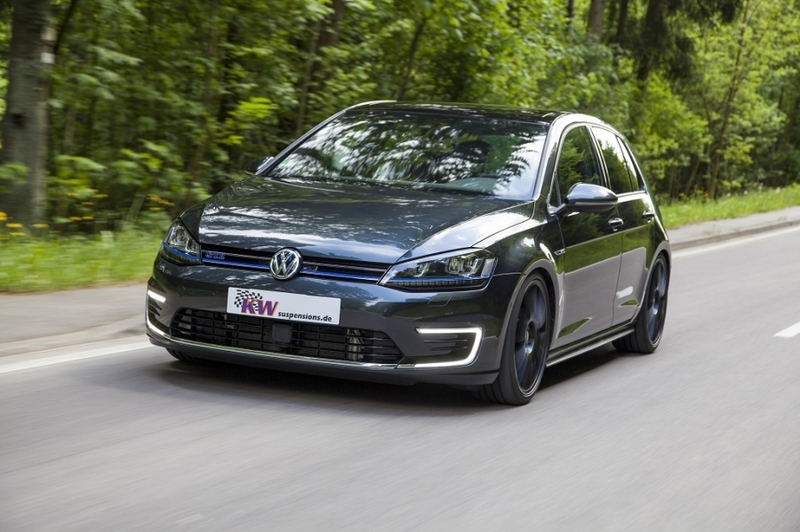 So the suspension manufacturer KW offers a coilover kit made of stainless steel for the first Volkswagen available as a “Plug-in-Hybrid”, the VW Golf GTE. 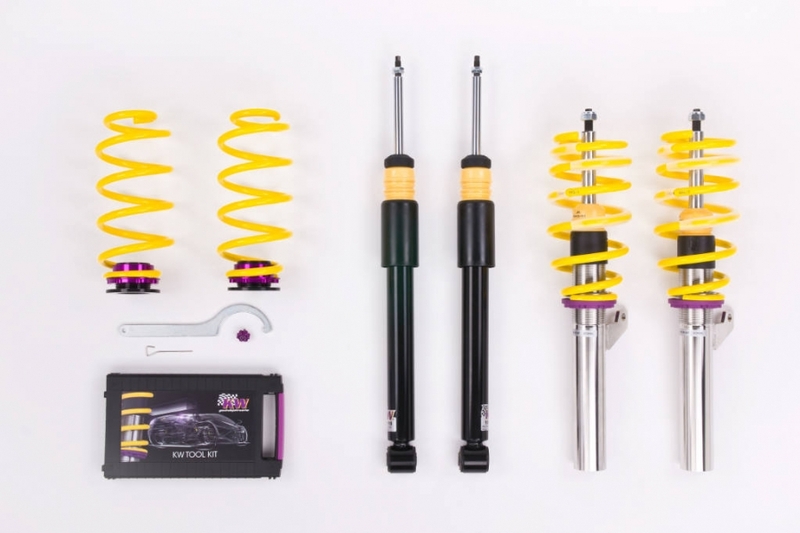 Besides the renowned Variant 1, Variant 2 and Variant 3 coilover kits, the adaptive KW DDC Plug & Play coilovers are also available for the first series Golf with a hybrid drive. The continuous lowering on all KW coilovers that are available for the Golf GTE has to be adjusted via the dirt-resistant trapezoid thread directly on the stainless steel strut housing on the front axle and via the rear-axle height-adjustment. According to the certificates, on both axles are tested lowering of 35 – 65 mm is possible. Most interesting is the adaptive KW DDC Plug & Play coilover kit. It is compatible with the Volkswagen DCC-suspension control. If the GTE gets equipped with the optional available DCC suspension, not only the engine performance changes by pressing the GTE button and electronic and fuel motor work together and reach a system performance of 204 hp, but also the KW dampers as well as the steering are then adjusted more dynamically. 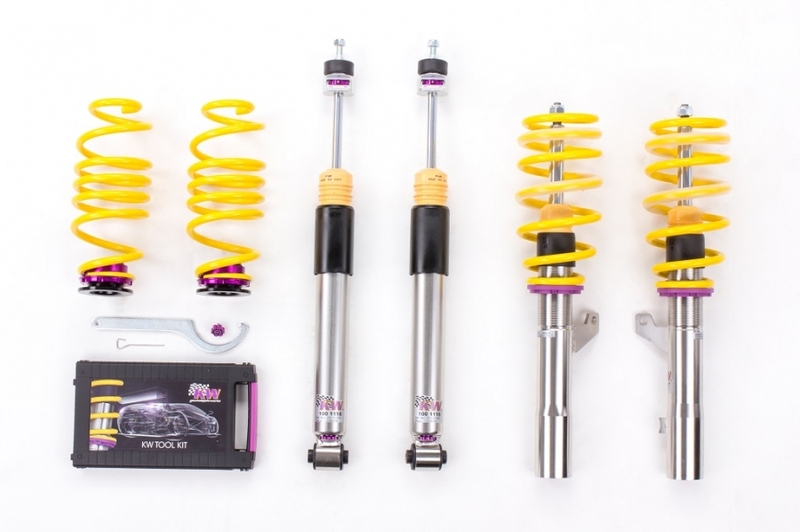 In case the Golf GTE was not equipped with an adaptive suspension kit when you bought it, the KW Variant 1, Variant 2 and Variant 3 coilovers are the first choice for retrofitting. While the Variant 1 has a fixed configured damper setting, the coilover suspension Variant 2 allows the adjustment of the rebound with 16 clicks for a more comfortable or stiffer driving pleasure. This makes sense especially when the Volkswagen-approved wheel / tire combination for the GTE has been changed. Even more fine tuning to the driving dynamics are provided by the KW Variant 3 coilover suspension. Here the rebound can be adjusted with 16 clicks and additionally the compression can be adjusted independently with twelve clicks. A higher compression level at the front axle allows an even more direct steering. At the rear axle, higher compression damping forces dictate the oversteer threshold. Due to design of the compression valve assembly the deflection behavior during fast driving over bumps is not affected. With the patented adjustment at the lower stainless steel housing (compression) and upper piston rod end (rebound), tools are no longer needed. The rebound damping makes it possible to directly influence the handling and ride comfort. By increasing the rebound damping via the adjustment wheel, the body movements are reduced. The relatively heavy GTE then drives with even more directional stability and the drivers get even more stability at higher cornering speed. Via our “KW PRODUCT FINDER” at our webpage you can dial your perfect suspension for your car.